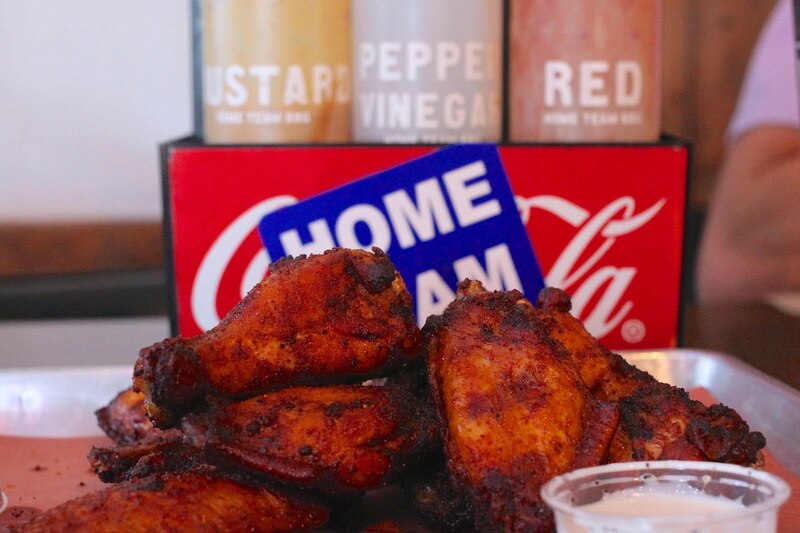 Home Team is known for its signature rub, which you can taste in just about everything including their famed wings, which are rubbed, smoked and then deep fried. Out of the three locations, the one to visit is in Sullivan’s Island — there, in addition to the stellar meats, you can find great vibes and frozen boozy concoctions like the Game Changer, with coconut, rum, pineapple and orange. In a large pot, bring water to a simmer and turn off heat. Add all ingredients and whisk until dissolved. In refrigerator, submerge chicken wings in brine for four hours. In a mixing bowl, combine all ingredients and stir until combined. Prepare a smoker with red oak and heat to 225 degrees. Remove brined chicken wings from liquid and pat dry. Add chicken wings to a large mixing bowl and evenly distribute all but four tablespoons of dry rub. Smoke chicken for two hours and 30 minutes. Once smoked, allow to cool and refrigerate. When ready, deep fry the wings in 325 degree oil until crisp. Drain and dust with extra dry rub.